How Does A Touch Screen Respond To Touch? Touch screens are so standard these days that we can hardly remember the magic and awe they brought when they entered the world stage. Even today’s toddlers handle touch screen devices with ease when they want to play their favorite video game or watch their cartoons on YouTube. Although they are everywhere these days, how do these touch screens work? Is there only one type? Let’s take a closer look at the first kind of touch screen ever introduced. These are the most basic and familiar types of touchscreens out there. Resistive touchscreens are used in ATMs and kiosks in supermarkets. A resistive touch screen consists of two thin flexible metallic layers separated by a small gap. These two layers contain an electric current running through them. When someone touches the top flexible layer of the screen, it pushes down and touches the bottom layer, thus interrupting the flow of current. The device can detect this contact precisely where it occurred, which may correspond to the desired button a person was attempting to push. A resistive touch screen is solely responsive to pressure and is oblivious to what actually touches the screen. Anything from a finger to a glove or a stylus will all work on such a resistive touch screen. Swiping and multi-touch features are not supported by this kind of screen. This is why resistive touch screens are not used in smartphones. The actual display is also always behind glass, which makes the viewing experience of these screens a bit more hazy. Capacitive touch screens are the second-most popular choice for manufacturers when it comes to implementing touchscreens. 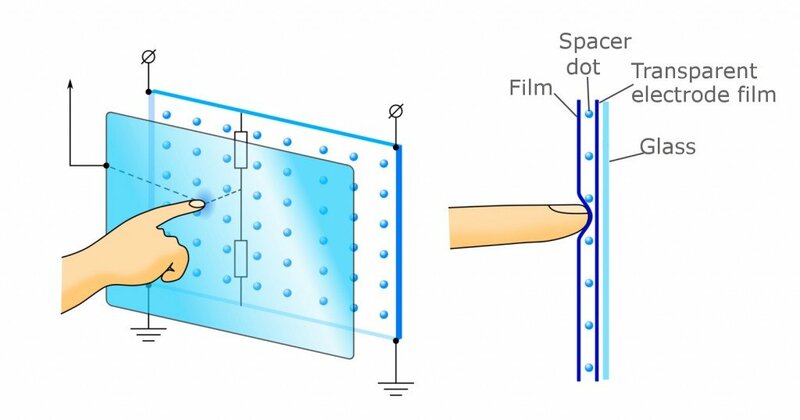 A capacitive touchscreen employs the use of a transparent electrode layer. This layer is placed on top of a glass panel and then covered by a protective layer. When a finger touches the screen, some of the electrical charges transfer from the screen to the user. Sensors present on all four sides of the screen can detect this decrease in electric current. A controller is present that detects the point on the screen a person has touched. The unique feature of the capacitive touch screen is that it will only operate at the touch of a human being or a stylus. The advantage of a capacitive touch screen is that it has great image clarity in comparison to resistive touchscreens. It has a durable screen with extreme resistance to surface contaminants and liquids, such as dust, grease and water. However, the downside to these is that they are highly susceptible to electromagnetic interference and radio frequency interference. The working of Projected Capacitive Touchscreen is very similar to regular capacitive touchscreens, but they do possess two significant advantages over normal capacitive touchscreens: they are responsive to surgical gloves or thin cotton gloves, and they make multi-touch features possible. Multi-touch relates to when two fingers simultaneously activate the touchscreen. 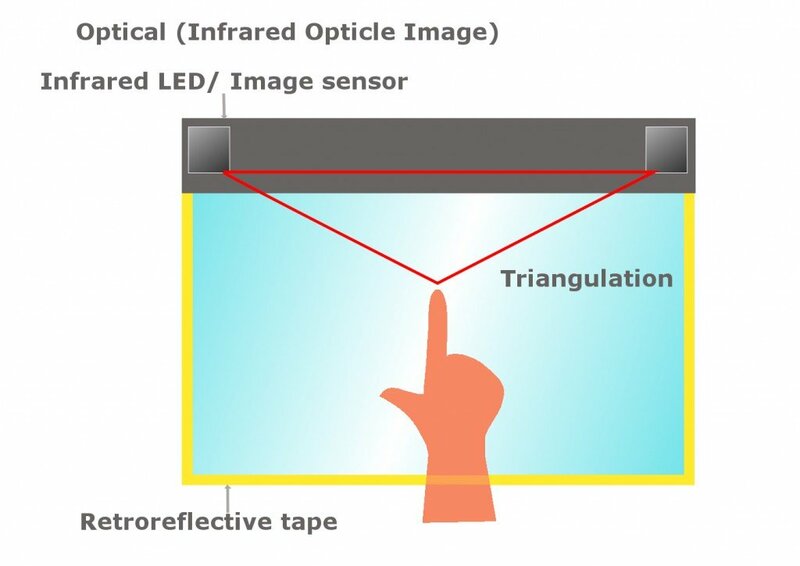 A projected capacitive touchscreen consists of a sheet of glass with embedded transparent electrode films and an IC chip, which creates a three-dimensional electrostatic field. A change in the electrical currents is detected when a finger touches the screen. A touch point is then detected. Projected capacitive touchscreens are being used more and more in different industries, and are generally chosen over regular capacitive touchscreens because of their durability. Unlike other technologies, infrared touchscreens do not overlay the screen with an extra layer. These types of touchscreens are based on light beam interruption technology. An infrared touchscreen uses infrared emitters and receivers to create an invisible grid of infrared light beams across the screen. Not having an extra film or layer means the best possible image quality and clarity. A sensor detects a person’s touch when an object interrupts the light beams. This enables multi-touch and also does not require the user to apply pressure to register a touch. Even if the screen is scratched, it works completely fine, and other objects aside from one’s fingers can be used to work with this touchscreen. The disadvantage to this technology is that sunlight can sometimes affect its functionality. A Surface Acoustic Wave (SAW) touchscreen works a little differently than resistive and capacitive touchscreens. 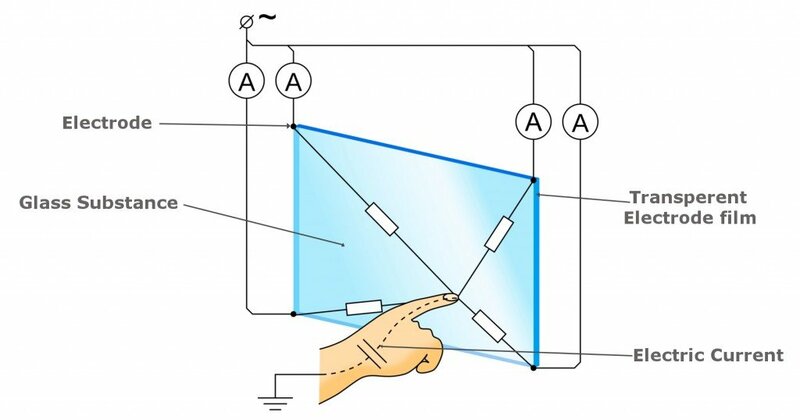 SAW touchscreens use transducers mounted on the edge of a glass panel. The transducers create an invisible grid of ultrasonic waves on the surface that are received by sensors, hence the name surface acoustic wave. When a user touches the screen, some of this wave is absorbed. The receivers locate the touch point and send this information to the computer. SAW touchscreens can be activated using a finger, a gloved hand or even a stylus. They are easy to use and offer high visibility, in addition to boasting high optical clarity and a long touch life. They do have a few disadvantages, namely that they cannot be activated with hard objects, e.g., pens, credit cards or fingernails. False touches are also a risk, especially by water droplets, while solid contaminants on the screen can create non-touch areas until the dust or dirt is removed.